I learned about tonka beans last year during my first trip to Montrèal. I bought some from Olives et Épices, a fantastic specialty store selling spices, oils, vinegars and a host of other wonderful ingredients. The store, and pastry friends, instructed me that tonka must be heated (eg. through infusion in a cream or baked in a cake). I experimented with tonka crème brulèe and tonka ice cream, and although good, neither product stood out for me. During the past few years, I have seen tonka used in the desserts of several fine restaurants, both in Toronto and during my travels: I started to believe tonka had become trendy. I hadn't appreciated the flavour of tonka until I returned to Montrèal in January. On the trip, I had an amazing tonka pot de crème (served with an orange salad and cocoa nibs) at la Montèe de Lait. I liked the dessert so much that I thought I would recreate it at home. The result turned out very well, and I am enthusiastic to share the recipe. Instead of garnishing the pots de crème with cocoa nibs, I used a 70% dark chocolate, which also worked well. If you want to try the recipe with cocoa nibs, check out Whole Foods Market: they sell small bags of it. 1. In a medium saucepan, heat 1 3/4 cups of the light cream with the grated tonka bean until cream is scalding. Do not boil. Remove from heat and set aside. 2. Beat egg yolks until they are pale in colour. Beat in the sugar, salt, and the remaining 1/4 cup of the light cream. 3. Gradually beat the hot cream into the egg yolk mixture, stirring constantly. 5. Place pots de crème cups in a large pan with sides high enough to create a water-bath. Divide the mixture evenly into the cups. Pour hot water in the pan to come halfway up the sides of the cups. Cover the pan with aluminum foil or cover with the pot lids. Place in oven and bake at 350°F (180°C) until the custard is just set around the edges, approximately 30-35 minutes. 6. Carefully remove the pan from the oven. Leave pots de crème in pan in water bath, and allow them to cool to room temperature. Remove the pots de crème from water bath; cover them with plastic wrap and chill in refrigerator for at least 2 hours. 7. 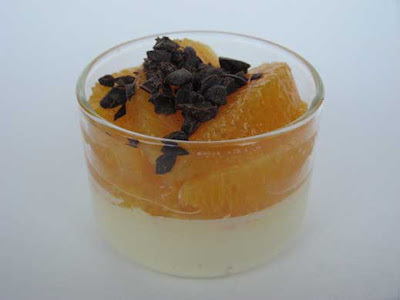 Serve chilled pots de crème with segmented oranges and cocoa nibs or 70% chocolate. Posted by Sam at 5:13 p.m.
Oh! This is a dessert after my own heart, cream, citrus and chocolate. I love the combinations...I always feel better after looking at your creations! Hi Sam! Thanks for the information on tonka beans, they sound lovely and fragrant. The pots de crème sounds like a mingling of decadent flavours - particularly with the citrus and dark chocolate.